Oooh, I love a factory sample. These arrived this week and I’m so excited to share them with you. 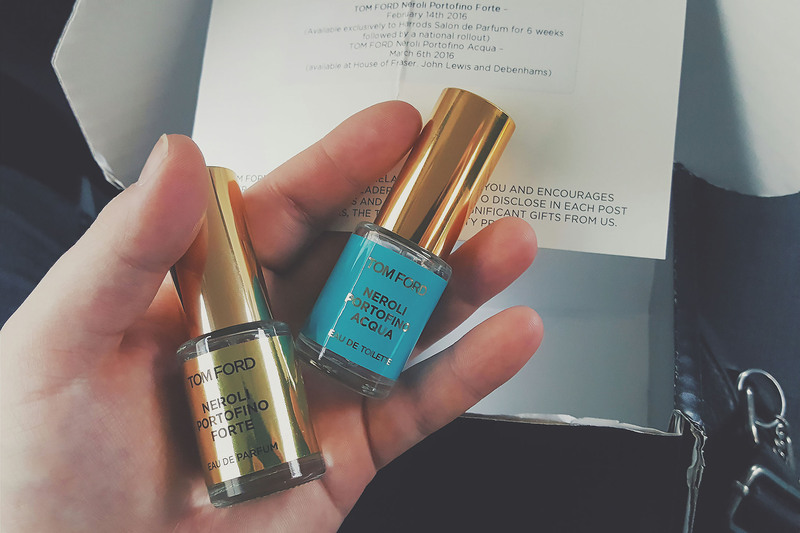 Two new editions of TOM FORD Neroli Portofino will be launching in the coming weeks and if you’ve not yet experienced Neroli Portofino, you can read my original review here. Yaaaas. This is what I’ve been waiting for! The problem I have with the original NP is that on me, it just doesn’t last long enough plus I like a fragrance to pack a punch. This intense variation of Neroli Portofino will be available exclusively from Harrods (Salon de Parum) for 6 weeks from 14th February 2016 after which it’ll be rolled out nationwide. I’ve not got a price but I’m taking a punt that it may be a little more than the £145/50ml price tag of the original. I hate to state the obvious, but with Forte being stronger, with the name Acqua, this is unsurprisingly but deliciously more aquatic. This just has cocktails by a Mediterranean swimming pool in the pounding heat written all over it. Probably similar in silage to the original and oozes summer in a bottle. Neroli Portofino Acqua will be available nationwide from the 6th March at House of Fraser, John Lewis and Debenhams. I’m again guessing, but would assume NP Acqua to be retailing at £145/100ml. This article first appeared on MANFACE written by Thom Watson. It was published on Wednesday 27th January 2016 and was last updated on Monday 3rd April 2017 at 1:14pm. It's categorised under Aromatic Fragrance, Citrus Fragrance, TOM FORD where you'll find more related content. where can i buy samples of these two new scents?? Soooo curious and impatient.